With safety being our number one priority, we suggest combining the MyRack Mono-Lift attachment with a set of spotters or dual safeties when lifting heavy. The Force USA MyRack Mono-Lift attachment is strong enough to handle a massive amount of weight. Its designed to be safe for solo use, but for heavier lifts, its always recommended to have spotters available. 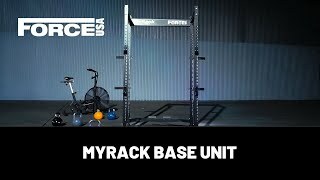 Force USA also recommends that your MyRack is securely fastened to the floor and/or wall.